In this series of videos we answer some of the most commonly asked questions we receive from clients. 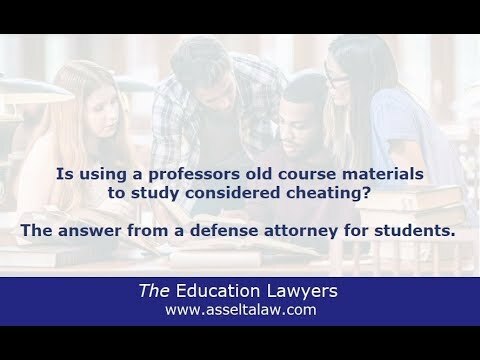 Accused of cheating in college? Top 3 tips from a defense attorney for students. 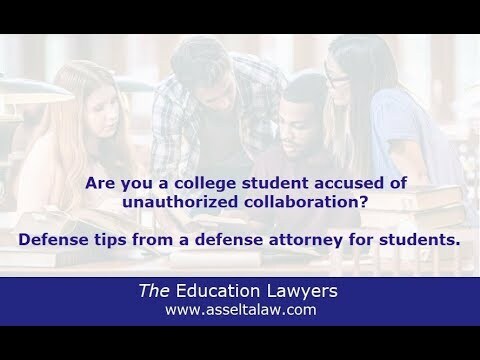 Accused of unauthorized collaboration in college? Defense tips from an attorney. 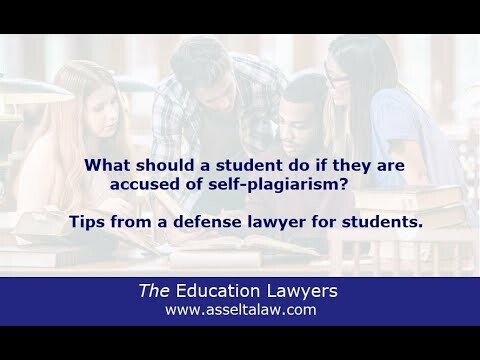 What should a student do if they are accused of self-plagiarism in college? The answer from an attorney for students. 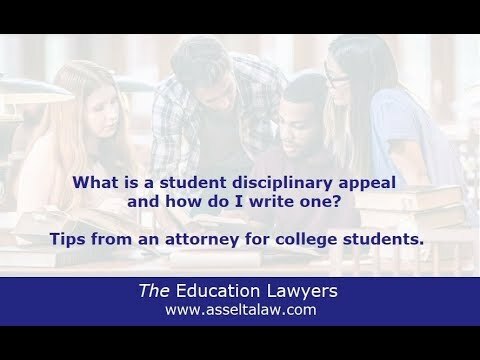 How to write a student disciplinary appeal. Tips from an appeal lawyer. 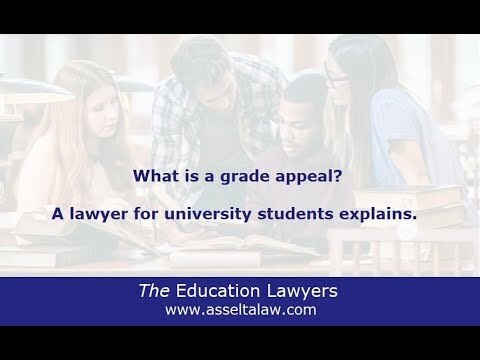 What is a grade appeal? A lawyer for university students explains. 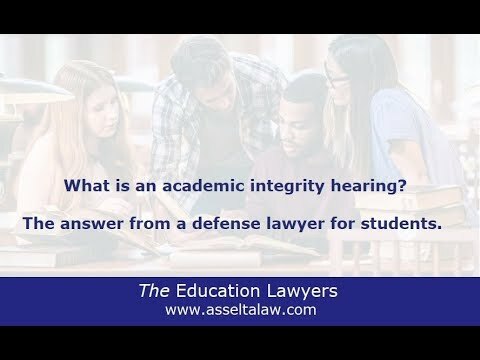 What is an academic integrity hearing? A defense lawyer for students answers. 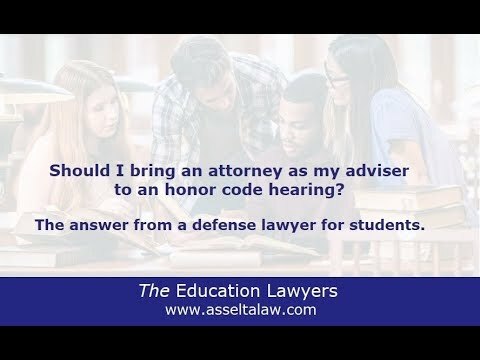 Should I bring an attorney as my adviser to an honor code hearing? Is using a professors old course materials considered cheating? 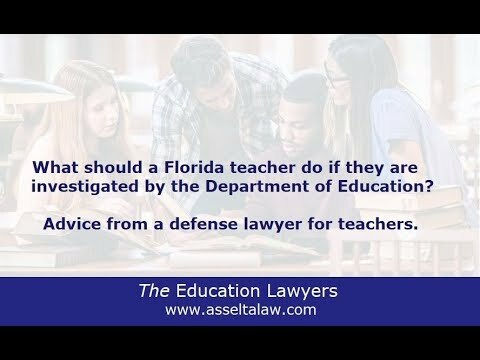 What should a Florida teacher do if they face an investigation by the Department of Education? 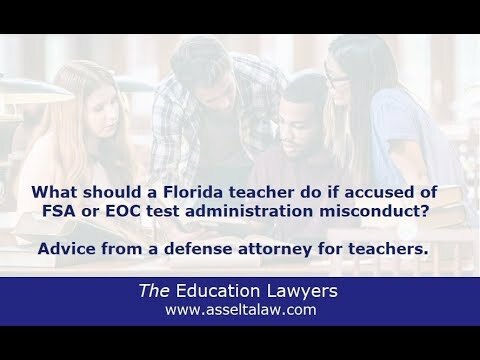 What should a Florida teacher do if accused of FSA or EOC test administration misconduct? Can I raise ineffective assistance of counsel on appeal? Will I be required to testify at the appeal or be present during any of the appellate proceedings in Florida? Where can I find the rules that govern appeal? What possible outcomes can I expect in my civil matter? What makes a strong appellate attorney? What is the effect of denying certiorari by the U.S. Supreme Court? What is the difference between a trial attorney and an appellate attorney in Florida? What is due process in a school setting? What documentation do I need to provide to have an emotional support animal/assistance animal in Florida? What can I do if a Florida breeder sold me a sick puppy? Why students should be careful when connected to their schools Wi-Fi. Bought a paper or assignment online and got caught? Advice from a lawyer for students. If the school district is not following my child’s IEP or the IEP is not working, what can I do? If my child has special needs or is in special education, what rights do I have with the school district? Caught with drugs or paraphernalia in school? Advice from a lawyer for students. If my child brings a backpack to school in Florida, can it be searched? Accused of forging a Doctor's note, sign-in or internship log in college? Should I bring an attorney to a university disciplinary hearing? If I think my child has special needs and he is not in special education, what rights do I have with the school district? If a college or graduate school files academic or disciplinary charges against a student, does that student need an attorney? If a college graduate or doctoral student is dismissed from school, what legal options do they have? I have always had a clearly posted no pets policy at my establishment. Do I still have to allow service animals in? How do I know whether I have a good appeal? Does the Fair Housing Act FHA apply to all housing? Does it matter for appellate purposes whether my case was tried in state or federal court? Accused of cheating on the SAT or ACT? Advice from a lawyer. Does an emotional support animal need specialized training in Florida? Tips for fighting a suspension or expulsion from a K-12 school from a lawyer for students. Does an appellate court in Florida hear witnesses to testify? Does a Florida tenant have to pay for damage done by his or her emotional support animal/assistance animal? Caught changing research results or data in college? Tips from a defense lawyer for students. Do I have to retain the trial attorney as part of the appellate team? Accused of cheating on the FTCE? Defense tips from a lawyer for teachers. Do all Florida attorneys handle appeals? Denied A Teaching Certification In Florida? Tips from a lawyer for teachers. Can the landlord charge me a pet/security deposit for my emotional support animal/assistance animal? Can new evidence be heard at my appellate hearing in Florida? Can my child’s conversations at home on the phone or computer with friends lead to discipline at a Florida school? 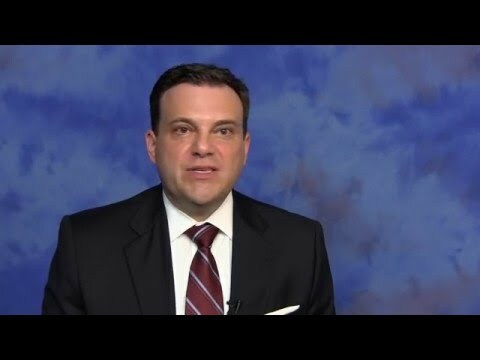 Can my child pray at a public school in Florida? Can my child be suspended from a Florida public school without a hearing? Can I sue a school in Florida for violating FERPA? Can I speak at Florida school board meetings? Can civil cases be appealed in Florida? Can any attorney argue a case before the U.S. Supreme Court? Can animals besides cats and dogs act as emotional support animals/assistance animals in Florida? Can a person have more than one service or emotional support animal in Florida? Can a Florida landlord or housing provider delay granting my request for an emotional support animal/assistance animal? Can a Florida landlord or housing provider ban my emotional animal/assistance animal based on breed? Accused of cheating by gaining an academic advantage? 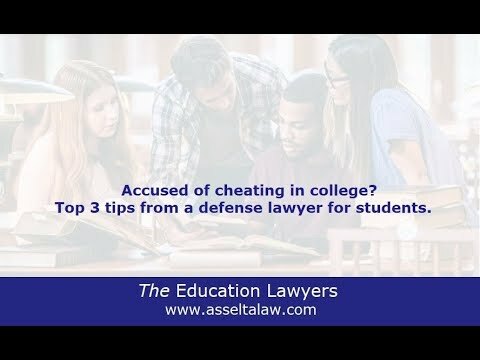 Defense tips from a lawyer for students. Can a Florida landlord or housing provider ask details about my disability? Caught cheating in school. Should you try to defend your actions? An attorney for students answers. As a teacher in Florida, what can I do if my principal does not like me and gives me an unsatisfactory evaluation? As a Florida school district employee, how should I respond to a negative evaluation? Are there appeals in Florida arbitration? Accused of cheating or plagiarism after graduating? Can your university rescind your degree? The answer from a defense attorney for students. Accused of cheating after taking a make-up exam? Tips from a defense lawyer for students. Am I required to have a lawyer for an appeal in the State of Florida? Am I entitled to due process in a Florida private school? What happens at a university student hearing? A defense lawyer for students answers. Accused of selling or trading old course material online? 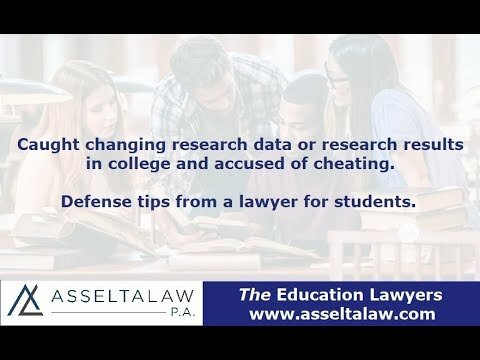 Defense tips from a lawyer for students. Why is your student handbook important? Can you be accused of cheating or plagiarism if another student borrows your computer? Can a student get in trouble if they give old class materials to a friend? 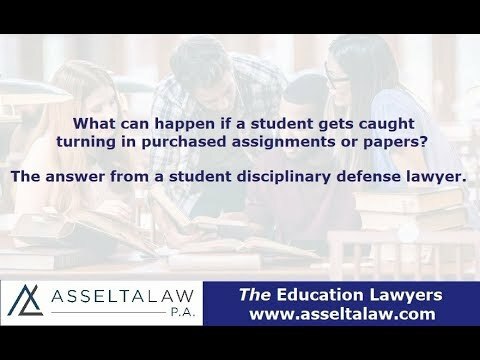 What can happen if a student gets caught turning in purchased assignments or papers? Accused of cheating after giving someone else your online login for a course? Tips from a lawyer. Can a university withhold your transcripts? The answer from a defense lawyer for students. 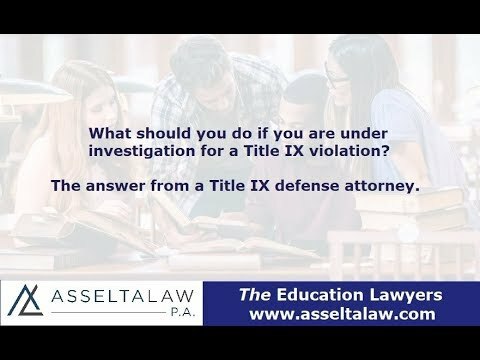 What should you do if you are under investigation for a Title IX violation? A lawyer answers. What happens at a Title IX hearing? A disciplinary defense attorney for students answers. 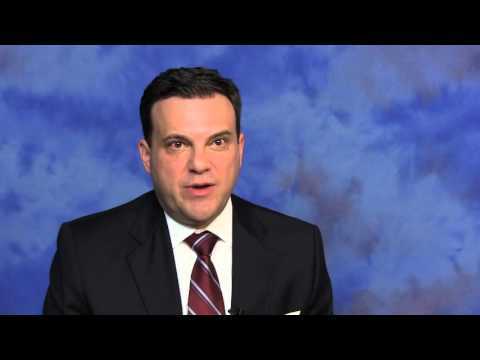 Can a student be suspended or expelled for something that happened off-campus? A lawyer answers. What happens when your SAT score is under review? A defense lawyer for students answers. What should you do if your ACT score is flagged for irregularities? A defense lawyer for students answers.